Far too often do we jump at the chance to speak our mind, offer our opinions, and give orders without first hearing the other person out or identifying what the real issue is. We might even find ourselves listening only with the intent to reply and not with the intent to understand. 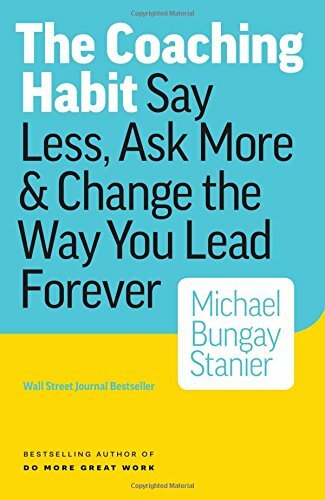 In contrast, bestselling author Michael Bungay Stanier proposes developing The Coaching Habit in order to be a better leader and help others unlock their full potential. Notice how the title specifically says "The Coaching Habit" and not coaching tips or coaching steps. This was most likely intentional because coaching isn't or shouldn't be a sole task on your to-do list. It should be a part of your daily routine if you seek to help others generate maximum impact and results on a regular basis. For this reason, the author starts by highlighting how to develop the habit based on most recent research and one of the findings suggests that we should acknowledge resistance whenever we try something new. Doing this right at the outset helps us prepare for possible setbacks. Through planning, we can identify what we should do to prevent falling off the wagon, what to do if and when we fall off the wagon, and how to get back on the wagon, so to speak. Once we see coaching as a process instead of a destination, we can focus our mindset towards continuous and ongoing improvement. The Kickstart Question: What's on your mind? The Focus Question: What's the real challenge here for you?" The Strategic Question: If you're saying 'yes' to this, what are you saying 'no' to? While each of these questions is powerful in their own right, asking them in this order will help facilitate deeper connections and richer conversations with others. The Kickstart Question puts the spotlight on what the other person wants to talk about while the AWE Question helps uncover the underlying issue or main problem related to the topic. The Focus Question pinpoints how this issue is specifically relevant for the person and the Foundation Question helps translate what the person now wants to happen. The Lazy Question puts things in perspective by connecting your help/expertise/support to his/her problem while the Strategic Question helps analyze the problem in the context of other problems, tasks, or activities. Lastly, the Learning Question allows the person to make the essential connections for him- or herself. This is where real growth takes place as he/she becomes more aware and self-sufficient. What many coaches or leaders might not realize is that coaching isn't about having all the answers and simply telling them to others. It's not about giving orders either or listing solutions right at the outset. Effective coaching entails creating space for others to have their own learning moments. Think about it. When you look back on your greatest lessons, your profound learnings most probably came from your own experiences or when you've come to your own conclusions. This is because people learn better when they themselves engage with the lessons, when they themselves connect the dots, and when they themselves reflect and analyze how it will be useful for them. Becoming a great leader or a great coach is essential in today's world. But while it is possible, it will take some time and practice. Strive to develop the coaching habit by acknowledging resistance, asking the seven essential questions, and creating space for others to have their learning moments. "Building a coaching habit will help you regain focus so you and your team can do the work that has real impact and so you can direct your time, energy and resources to solving the challenges that make a difference." Share in the comments below: What did you find most useful from this article/book? How do you plan on developing and applying the coaching habit in your life? Since one of the best ways to improve ourselves is to commit to continuous learning, this post is part of the blog mini-series called 3 Takeaways where I discuss three insights from thought-provoking leaders, books, and podcasts on a monthly basis.